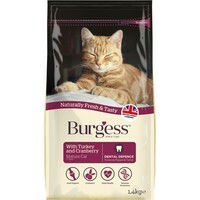 Burgess Mature Complete Cat Food (Turkey & Cranberry) has been specially designed to support cats into their senior years; especially suitable for cats over 7 years of age. Combining healthy cereals, natural antioxidants and essential nutrients with a great British protein source, the food specifically targets problem areas and helps to support them to keep your mature cat happy and healthy. Burgess Mature Complete Cat Food also contains a specialist ingredient to reduce plaque formation and support healthy teeth and gums. Brilliant! Having tried several well known brands of cat food decided to give this a go and my cats absolutely love it! They clear their bowls every meal.